Big, ground-scratching, buzzy scrub sparrow. Abundant in year round in much of the west, winter in Texas, summer in Idaho, Montana and Wyoming. Timing: year-round. Prefers open shrubs with thick undergrowth, edges, backyards and weedy fields. Medium and chunky with a short, conical bill; plumage is black, rust and white. Double- scratch forager. 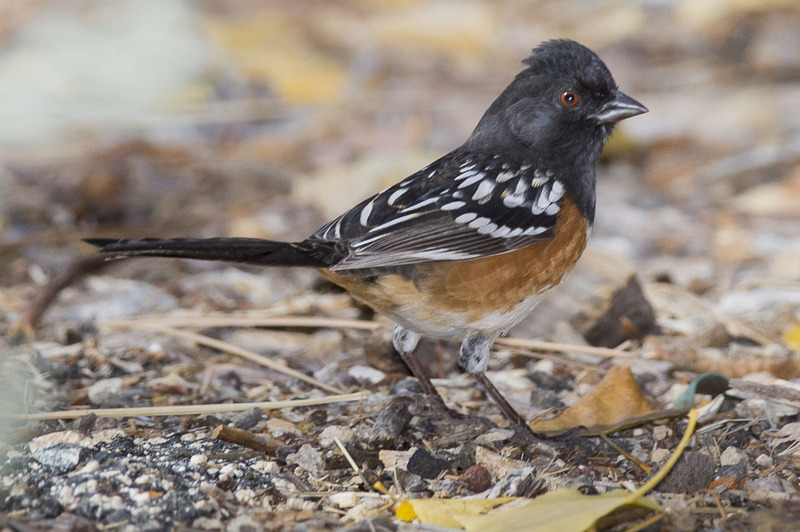 Formerly grouped with Eastern Towhee as Rufous-sided Towhee. Diet includes insects, acorns, berries and seeds. Oldest wild individual recorded was 11. Population ~ 27 million.